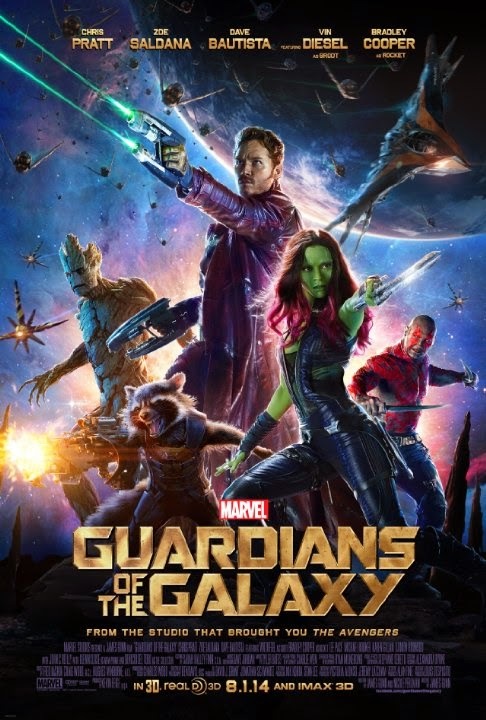 I was able to watch Guardians of the Galaxy on its first weekend and I enjoyed it even I have not read them in comics. Guardians of the Galaxy is the tenth film for Marvel Cinematic Universe (MCU) following Captain America: The Winter Soldier. In 1988, a young Peter Quill visits his dying mother with cancer, giving him a gift before dying. Running away from the hospital, he was then abducted by a spaceship. 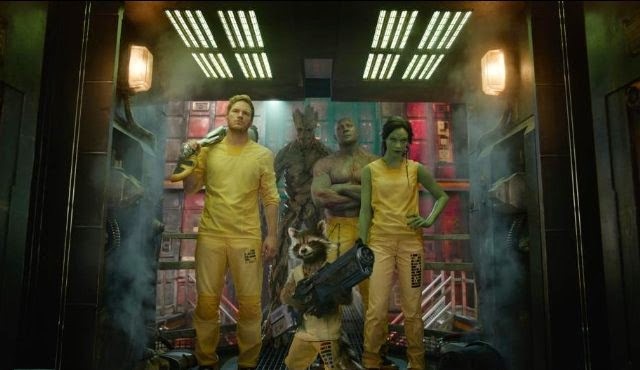 Fast-forward to present, a grown-up Peter (Chris Pratt) is shown, raised by the space-pirates, led by Yondu (Michael Rooker), who abducted him. On an uninhabited planet, he is on search for an orb artifact. Upon getting the artifact, Korath (Djimoun Hounsou) tried to get the artifact from him but was able to escape from the Kree soldiers after him. Finding out that he has the artifact, Ronan (Lee Pace) sends Gamora (Zoe Saldana) after him. Yondu sensing Peter will sell the artifact and will not cut him with the sales sets a bounty for him. 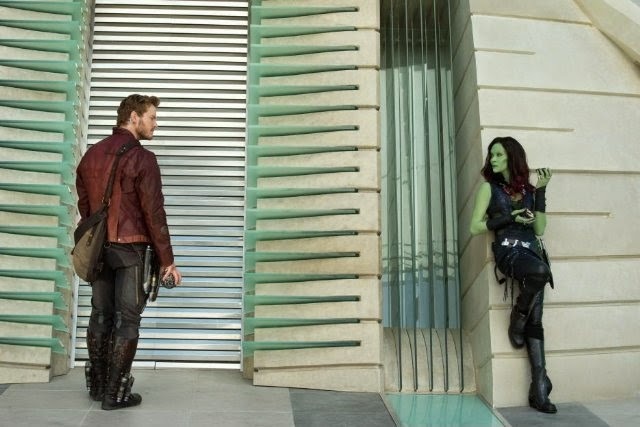 On planet Xandar, Gamora catches up and takes the artifact from Peter, but he was able to get it back. 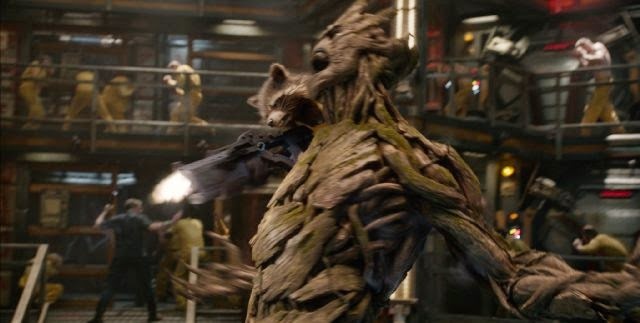 During their fight, Rocket (Bradley Cooper) and Groot (Vin Diesel) tries to get him for the bounty. Nova Corps arrests the four for their existing criminal charges and sends them to a prison facility floating in space. 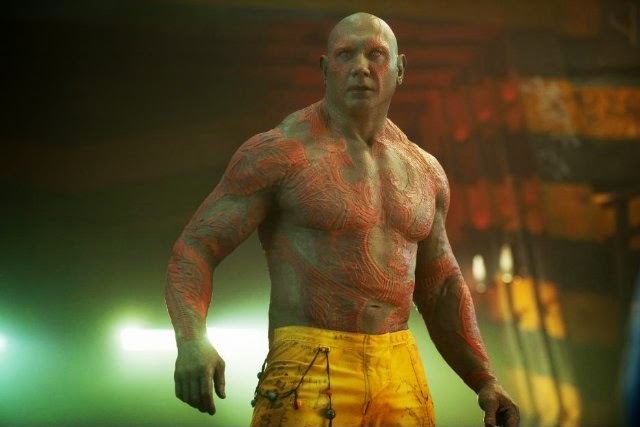 An inmate named Drax (Dave Bautista), who has grudge against Ronan, tries to kill Gamora but Peter asks him not to and suggested that he might be able to get to Ronan with Gamora alive. Gamora shared her plans of selling the artifact to her contact and splitting the sales. With Rocket being able to escape several prison facilities multiple times they worked a plan to escape the prison together with Drax. Arriving in Knowhere, they finally meet Gamora's contact buyer shown to be Taneleer Tivan (Benicio del Torro), more known as The Collector. They finally learned that the artifact contained an object that contains immense power that can destroy planets. Taneleer's assistant tried to get hold of the object but was obliterated and also destroyed his place. Ronan with message from Drax was able to track them in Knowhere and Yondu was able to follow them too. A chase ensues and Nebula (Karen Gillan) was able to get the gem from Gamora. 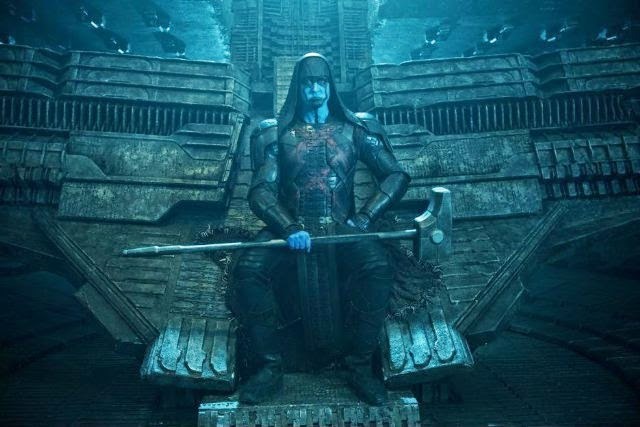 With the knowledge what the gem can do, Ronan plans to destroy planets starting with Xandar. Peter and the group realizing the situation must work with Yondu, and his space-pirates, together with the Nova Corps to prevent Ronan obliterating Xandar and destroying the galaxy with the power currently in his possession. Prior to the movie, I have not known or read any comics of Guardians of the Galaxy. Unlike other superhero comics such as Spider-Man, X-Men, Superman or Batman, I have no idea who the Guardians of the Galaxy are. This movie was able to introduce the characters without the need of reading the comics. Peter Quill's sense of humor also adds comedy factor for the movie. The many references to 80's pop culture such as Kevin Bacon and Footloose together with soundtrack will make you enjoy the movie a lot. I will give this movie a rating of 8 out 10. With the sequel already announced, I hope they can include back-stories for each character so that we'll know more about them. Peter was able to hold the gem for a period of time without being destroyed. As Nova Corps examines him at the end of the movie, they discovered that he was half-human and half-alien race which is an ancient race. In the comics, Peter's father is an Emperor of Sparta, an alien-humanoid that visited earth once. Peter was raised by Yondu, the space-pirate who abducted him and always says that Peter owes him for not letting him killed. But there are several instances Yondu mentioned he might need to bring him to his "biological father". This might mean that the abduction was under his father's orders since his mother already died. Yondu may be a space-pirate in this movie, but in the comics he is a member of the earlier incarnation of the Guardians of the Galaxy. He is played by Michael Rooker, who played Merle Dixon on The Walking Dead TV series. This is the first Marvel Cinematic Universe (MCU) movie featuring Thanos within the movie. He was previously seen on the post-credit scenes of The Avengers. Thanos is said to be the main villain for The Avengers 3 in Phase 3 of MCU. This movie centers on the Infinity Gem that has the capability to destroy, the Power Gem. This will be the third Infinity Gem to be shown in MCU. The first one is the Tesseract Cube (Space Gem) shown in Captain America: The First Avenger and The Avengers. The second one is the Aether (Reality Gem) shown in Thor: The Dark World. Some say that Loki's scepter in The Avengers also has a gem on it, but it's not yet confirmed. Currently this was last seen held by Baron Von Strucker in Captain America: The Winter Soldier. Stan Lee makes his cameo as an old man trying to hook up with a young girl. He is shown while Rocket scans for potential bounty targets. This will mark as his 21st cameo on a Marvel film. Although sharing the same cinematic universe with The Avengers movie, there are no direct connections shown with The Avengers storyline. The only connection that can be made is with The Collector appearing on Thor: The Dark World as they entrust the Tesseract Cube to him during the post-credit scenes. The tesseract is also briefly shown in The Collector's vault. I am still not sure what exactly is The Collector's agenda for collecting the gems. Is he working for Thanos or for someone else? In the post-credit scenes, The Collector is seen seating while looking at his destroyed vault. The dog who licked his face is said to be Cosmo. 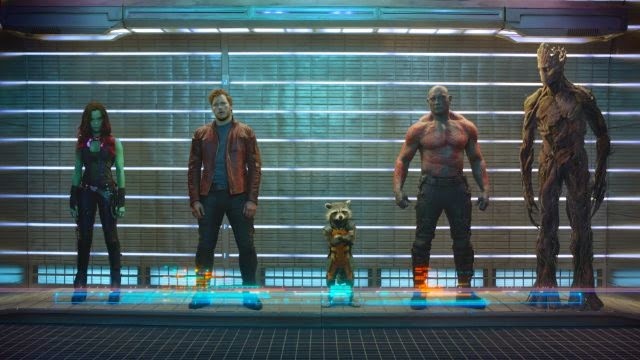 In the comics Cosmo is a member of the Guardians of the Galaxy. Also in the post-credit scenes, as Cosmo licks The Collector's face an anthropomorphic duck tells his disgust on licking him. This duck is Howard the Duck, who is a Marvel comic character who also had a movie in 1986. This might hint that Howard the Duck will have his own movie or Marvel Studios is just showing that he is part of MCU. If you are fast enough, you will notice that part of The Collector's collection includes Chitauri soldier from The Avengers and a Dark Elf from Thor: The Dark World. I find it funny with the names of some characters like Ronan the Accuser, Korath the Pursuer and Drax the Destroyer. This is second time for Zoe Saldana portraying a colored character. The first one was when he played Neytiri in Avatar. But unlike it, she portrayed Gamora through make-up not on performance capture.